We Need All the Friends We Can Get! The Lakewood Library Friends is a 503c non profit organization, that raises monies through membership and the yearly Book Sale which is part of LibraryFest. The Lakewood Library Friends support the Lakewood Branch of the Dallas Public Library by purchasing materials, supplies and furnishings, and by sponsoring and promoting events at the library that enrich the community. To contact the Friends please click here and send us an email. The Friends provide culturally rich events that enhance life in our neighborhood and support the Lakewood branch of the Dallas Public Library, a vital nexus of our community. 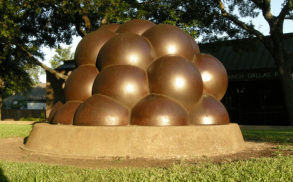 One of 2 large sculptures by L. Brough Miller. Download a printable Lakewood Library Friends form below.